To help you understand the current human rights situation in Sri Lanka, how we got here, and what we are doing about it, we have put together some information in the form of the frequently asked questions below. If you’d like to know anything else, please get in touch. What happened during the recent war? You can read more about the historical background of the conflict here. To make a long story short the fragile peace agreement of 2002 broke down completely in 2006. There was a steady escalation of violence and, in September 2008, the government expelled all aid agencies and foreign journalists from northern Sri Lanka. Full scale warfare then erupted. During the final stages of the war – January to May 2009 – an estimated 40,000 to 90,000 civilians were killed and some 300,000 were herded into ever-shrinking battlegrounds. Both parties showed disregard for those trapped between the warring factions and while the army shelled no-fire zones and barred access to aid organisations and media agencies, the LTTE prevented civilians from fleeing the war-zone using them instead as human shields and bargaining chips. Despite calls for a truce by the UN, various world leaders and the LTTE, the army finished its brutal onslaught and declared victory on 19 May 2009, having killed the LTTE's leadership. 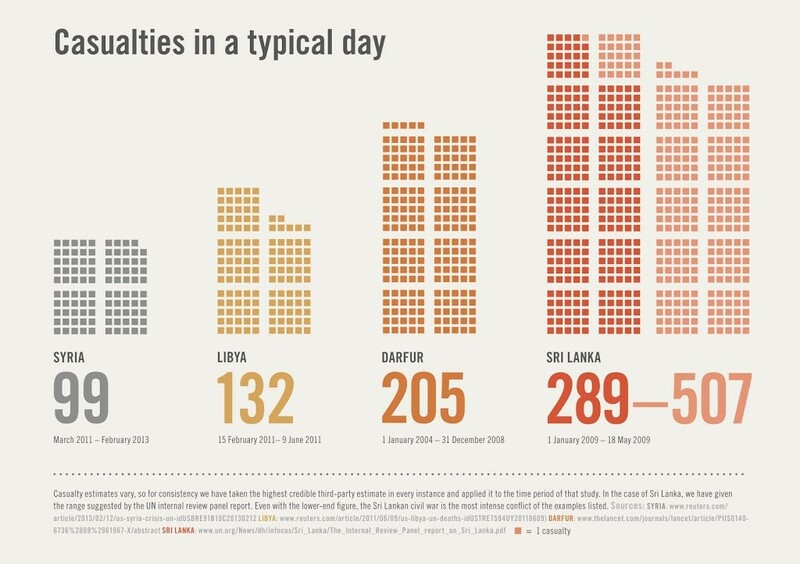 The UN has accused both sides of war crimes with most civilian deaths attributable to the Sri Lankan Army. The infographic below illustrates the scale of the bloodshed. Why does this still matter? There is a battle of ideas raging across the planet. We believe that human rights are universal, for everybody, and that without them you cannot have a lasting peace. Others think that you can deal with internal strife using purely military means, and that human rights are not necessary. It was this attitude that led to the crisis in Sri Lanka. But it is not just Sri Lanka that should be worried. The Government of Sri Lanka has been touting its "model" for dealing with internal strife through a series of visits and seminars. Burma, Turkey, Indonesia, Bangladesh, the Philippines and many other countries have expressed an interest in the "Sri Lanka Model". Meanwhile the institutions that are supposed to protect human rights - the UN Secretary General, the Human Rights Council - have been slow to act. A lot of countries around the world are watching what happens in Sri Lanka very very closely indeed. If the international community does nothing and Sri Lanka continues down its current track, then many will be encouraged to follow their example - crushing everyone who stands in their way with an even greater ruthlessness than before. The government of Sri Lanka talks of Human Rights as a "western" imposition. The former President's brother and Defence Secretary has actually said (when discussing his plan to ban all charities from Sri Lanka), "they talk of defending democracy and human rights. As far as I am concerned, democracy and human rights are western values. They are not for us." The language from the new regime has not been markedly different. Actually this is the opposite of true. Throughout history: from the slave trade and imperialism to the "war on terror", western countries have had a poor record when it comes to human rights. Meanwhile, from the liberation wars of Simón Bolívar, to the struggle for independence in Africa, and to the "responsibility to protect" doctrine the UN adopted in 2005 - it has been non-western nations that have led the struggle for human rights. There is a battle of ideas raging across the planet; and the winner will not be decided by the west. If Governments like Sri Lanka can get away with the lie that human rights are "not for us" then the strong will continue to oppress the weak - everywhere. I often hear the Tamil Tigers are responsible for this situation. What’s your view? The LTTE or Tamil Tigers ruthlessly eliminated Tamil opponents in its goal of becoming the sole voice of Tamils. The LTTE was also widely criticised for its forced use of child soldiers. The UN panel of experts reports strongly criticised the LTTE for multiple human rights' abuses and apportioned them a share in the blame for placing civilians in harm's way. However they were clear that most of the killing of civilians was caused by the Sri Lankan Army. Both sides share responsibility for creating the current situation but it is the Government of Sri Lanka that continues to abuse human rights to this day. Moreover, by refusing to allow any investigation into the past the Government of Sri Lanka protects the LTTE from the accountability they would otherwise, and should, face. Some of the worst LTTE violators of human rights, people such as Col Karuna, went on to serve as Sri Lankan Government ministers and continue to live in Sri Lanka with impunity. Unfortunately many of those with command responsibility in the LTTE were killed before they could face justice. We would however strongly support the prosecution of any surviving members of the LTTE command structure. This has been a key demand of the Sri Lanka Campaign from the very beginning. 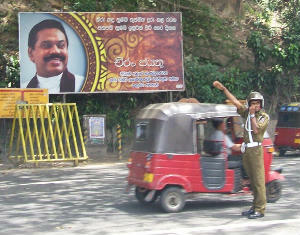 The war is over and I hear Sri Lanka has a new President. Aren't things better now? What is the current situation? While the armed conflict is over, the situation in the Tamil majority north and east of Sri Lanka remains grim. 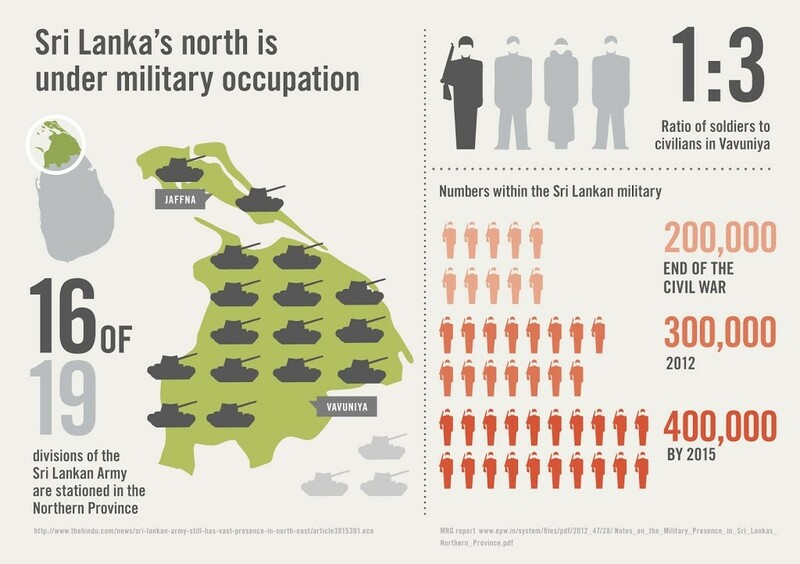 The presence many tens of thousands of Sri Lankan Army troops, coupled with roadblocks and frequent house to house searches, gives these areas a feeling akin to military occupation, and the climate of fear is palpable. The infographic above was commissioned in 2012 but we have received no credible subsequent information to suggest that troop numbers have diminished. Meanwhile, as a consequence of the culture of impunity human rights abuses and attacks on lawyers, journalists and aid workers continue and torture, sexual violence, and extra-judicial killings have been documented. More than 10,000 alleged insurgents, including former child soldiers were detained without charge or access to legal representatives. While it seems that many have been released, not all have and no public record of who is alive and detained exists. For this, and other reasons, Sri Lanka ranks second in the world when it comes to enforced disappearances, behind only Iraq. The tyrannical regime of the Rajapaksa family surprisingly lost elections in early 2015 and fell out of power. This does give us hope that Sri Lanka may yet make a recovery. Thus far the new regime has made some improvements in some areas but has done little to address the problems of militarisation or impunity. Day to day life in Tamil majority areas of Sri Lanka is much the same as it was under the previous regime. It is not at all clear that the policies of new government represents a sea change in attitudes to human rights and accountability, and even if they did, many aspects of the government's attitude to the Tamil population appear to originate not from the government but from a "deep state" within the military and security forces. Therefore it may be very difficult for Sri Lanka to truly reform its more structural and fundamental problems without support from the international community. We have set out a list of measures by which to determine if and how Sri Lanka is improving, and will report back on them in the course of the year. What is the Sri Lanka Campaign doing to change things? The Sri Lanka Campaign act as a solidarity organisation for critical voices within Sri Lanka, and above all for survivors of Sri Lanka's civil war. We use the fact that we are protected from harm to say the things that it would be too dangerous for them to say, and to amplify their voices. In particular we believe that the international community has a vital role to play in Sri Lanka. As a small country balanced between the spheres of influence of much larger powers, Sri Lanka is very susceptible to international pressure. Furthermore while meaningful change must come from within Sri Lanka, the various structural and systemic problems we mentioned in previous questions mean that it is very unlikely that these domestic attempts at reform will be successful unless supported by the international community. This is particularly true when it comes to the issue of accountability for war crimes, which we feel is at the root of many of the issues Sri Lanka faces. But time and again from the release of JS Tissainayagam to Jeyakumary Balendaran, to the ending of Sri Lanka's State of Emergency, to the removal of the Northern Province's military governor we have seen that progress on human rights issues only occurs in response to sustained pressure from the international community. We are a small organisation and so we have to be very strategic about how we can best persuade the international community to act. We find that people power, people like you supporting campaigns like this, is very effective. We also do a lot of work with the media and with opinion formers, diplomats, and United Nations officials. Our blog should give you a good idea of what we've been up to lately. Helped secure a UN Human Rights Council mandated international investigation into war crimes in Sri Lanka. Published a major opinion-forming report featuring allegations of ongoing crimes against humanity in the North of Sri Lanka, and another putting the wishes of victims at the heart of the accountability process. Commissioned a report using cutting-edge satellite image analysis to challenge the Sri Lankan army’s lies about how stolen land in the North is being used. Helped secure the release of detained human rights activist Ruki Fernando and Fr Praveen, and – finally – that of jailed mother of the disappeared Jeyakumary Balendran. Or follow us on twitter or facebook? How did the campaign form? The campaign came together in 2009 as a crisis response to the humanitarian situation in detention camps in northern Sri Lanka. However we quickly realised that what was needed was a comprehensive human rights campaign for Sri Lanka which would address the root causes of the problem. From the very beginning we were a multi ethnic non partisan campaign and our founders and subsequent key individuals have always been a mix of people of Tamil, Sinhalese and non Sri Lankan origin, with no political programme. This was important not just as a matter of principle but because we observed that much Tamil advocacy for human rights in Sri Lanka was too easily dismissed by the international community as being a consequence of political or ethnic vested interest. The Campaign started as a solely volunteer organisation and in its early days was little more than an email mailing list and a website. That mailing list became our Council of Advisors who continue to set the direction and priorities for the campaign. However since acquiring a small amount of seed funding in late 2010 we were able to rent an office and hire a part time member of staff. We remain a global campaign but our office is in London, which is where we are financially registered. Since then we have been able to able to expand a little, but we are still very small, with only 1.1 FTE members of staff. The majority of our work is still done by volunteers and supporters, people like you.